I wanted to like this book. I saved the review from the paper, my interest piqued. I was counseled to read the book by The Craftsmanship Initiative, whose quarterly newsletter is full of good things. Focusing on craft skill is right up my alley, the banner under which I march, and so forth. But Glenn Adamson, you lost me at page forty, when you took the same old, well-worn trail of Western hegemonic educators everywhere and implied that backstrap weaving was some antiquated form, estimable but sadly handicapped by its too-human parameters. "The most ancient forms of weaving had been done on standing frames or so-called 'backstrap looms,' in which the warp threads were anchored by the weaver's body. As she leaned back, the threads were put under tension.... This system can be used to make beautiful, though narrow, textiles -- only as wide as the weaver's body. 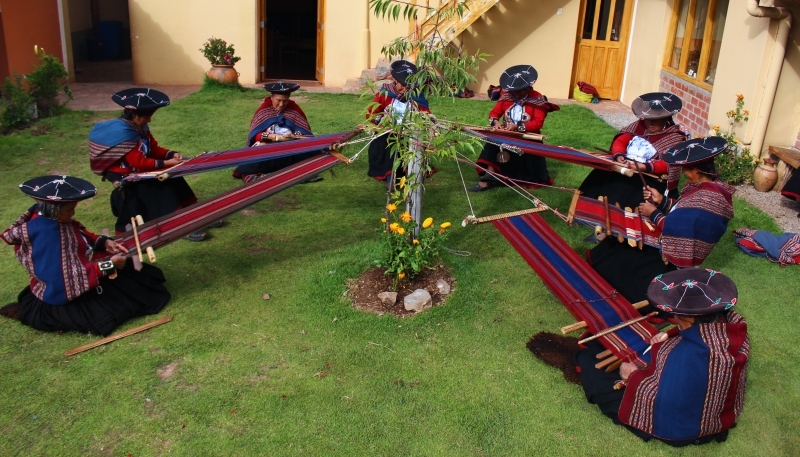 The complexity is limited to what the weaver can accomplish by hand, picking up threads one or a few at a time, and also limited to what the weaver can either plan and remember, or improvise. By contrast, the industrial looms that preceded Jacquard's innovations were able to 'remember' twenty-four or so different patterns, any of which could be applied to a given pick. This permitted great variation but nothing compared to what Jacquard achieved." By relegating backstrap weaving to the past, the author willfully ignores the bulk of handweaving expertise in the world today. By "bulk" I mean the sheer number of people who know how to do this thing, and are likely to practice it at some point in their lives, and/or to make use of the products of this weaving technique. And by "handweaving expertise" I mean the skill and knowledge that working with such a method requires, which is greater than that required for operating mechanized looms. Numerous and significant cultures maintain living, continuous backstrap weaving practices that have not been replaced by mechanization. 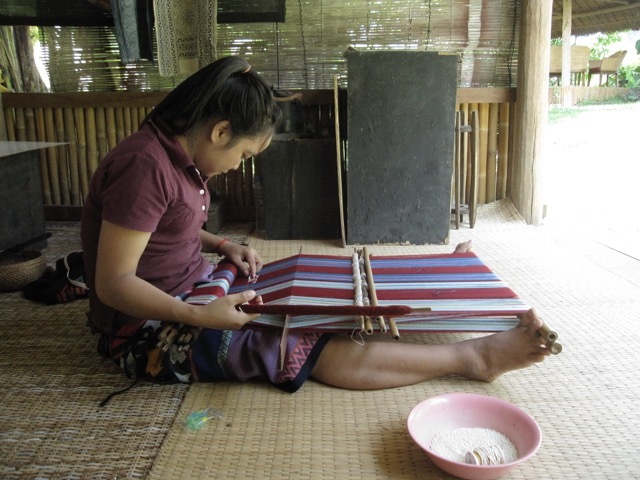 Anyone who lives in or travels to Southeast Asia or South America (very broadly speaking - I could get more precise, and I have,) or even sees the photos of travelers, will likely encounter some manifestation of backstrap weaving. Certainly in many places the skills or prevalence of backstrap weaving is much reduced from past glory, but this is not because looms were invented that replicated the intricacy and complexity of the woven work. It is because the availability of cheaper cloth led to a devaluation of the handwoven, labor-intensive fabrics, and cultures have subsequently lost the ability to sustain the practice in the context of a global market economy. In a Euro-centric narrative of weaving (which, if you’re building up to Jacquard, it is), tracing the origins to backstrap is erroneous, given that there is no evidence for this technique in Europe. Perhaps the term "standing frames" refers to warp-weighted looms, but the author skips over any elucidation of the term, in his eagerness to explain the limitations of backstrap weaving. Warp-weighted looms are in archaeological evidence throughout Europe[i], and can be more accurately considered as a practice of the past[ii], since this technology and its use in creating large-scale commercial cloth was replaced with increasingly mechanized looms. Current practice of warp-weighted weaving is more in the vein of revival, research, and historical re-enactment. Weavers using this practice as a tradition were "found" in the 1950's,[iii] but that very expression indicates that current practice is nowhere near the scale of backstrap weaving. With regard to the potential width of backstrap woven textiles, I would like to submit a simple fact and a few photos. At 18 inches wide, my hips are bigger than most of the traditional backstrap weavers I’ve known, and at the moment I have a 20 inch wide warp on the loom. It has taken me eight years to weave that wide, but that is a measure of my skills acquisition, not my body size. 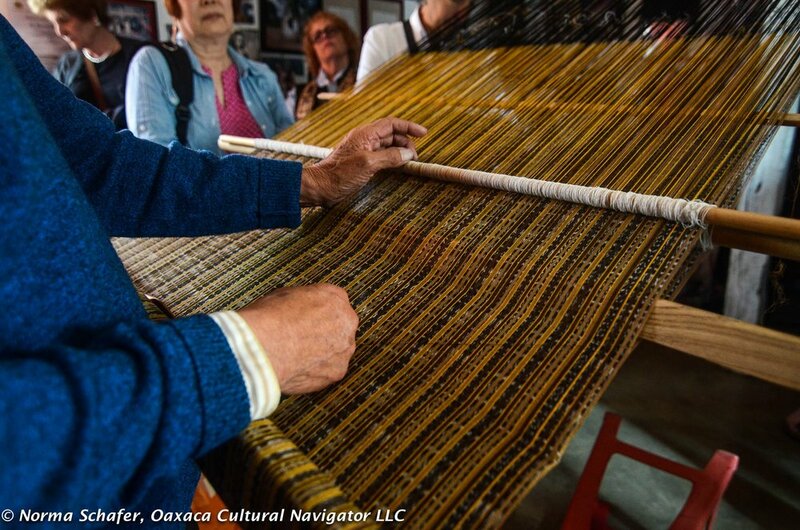 Weaving wide, as well as weaving long, or weaving complex patterns, or simply weaving at all on a backstrap loom requires an extensive skill set that is quite different from that of any type of weaving with a mechanized loom. The bodily control of tension, and the physical interaction with the warp yarns, differentiates this method in such a way that if Adamson had delved rather than dismissing it, he would have found a wealth of information to illustrate the very concepts in his book. The photos below, which I collected online and did not take myself, should effectively disprove the notion of backstrap weaving being “as wide as the weaver’s body.” There are body-related limitations, of course: one has to be able to reach the edges, manipulate the heddles and sword beater, and maintain proper tension. But as these weavers show, with advanced skill the width of the fabric can be impressive. Secondly, what makes you think that backstrap weavers can't change patterns with every pick? Let us be clear: backstrap weavers can do anything they want, as long as they level up to the necessary skills. They can pick up every row by hand, they can install pattern heddles, and they can add supplementary threads as they go. The designs and patterning evolve within the weaving tradition, in accordance with the prevalent techniques, so there are things certain weavers tend to do or not do, based on the logic of their technical methods. But they can change patterns as much as they like, including ways that are impossible on a mechanized loom, such as the scaffold weaving, or discontinuous warps, of Pitumarca. Take a moment to contemplate the detail below, woven as a single piece on a backstrap loom. The statement contrasting the Jacquard achievements with the limitations of handweavers seems to fall into a post-industrial trap: that of equating the most complex with the pinnacle of achievement. Changing every color in every warp in every pick may maximize variability of design, but that’s not the same as achieving the peak of expressive and technical capability within the medium. Again, a strange angle to encounter in a book extolling craft skill. ©Wendy Garrity 2018. Detail of contemporary kushutara weaving from Bhutan. Supplementary weft technique, woven on a backstrap loom. I'm addressing this because I come up against it repeatedly, in the world of museums and scholarly research into art, archaeology, technical skill, anthropology, etc. It seems that scholars using the example of weaving to support their argument believe that no one else could possibly know more than they do about the niche they are exploring, so if they can give the most rudimentary explanation of how a backstrap loom is operated, then they can speak with authority about the status of the craft historically. Or something. I mean, why else would you write a paragraph like that? There's a built-in presumption that no one is going to call you out on the accuracy of your representation, and the only reason for this would be that it's not important enough for other scholars to care. And certainly no one at the level of your readers will know about backstrap weaving, because after all it's an obsolete practice. Which means the starting point is disdain for the position this craft skill holds in the world. Think about that. Like some 19th century anthropological diorama, backstrap weaving is only ever invoked to demonstrate why it fell by the wayside. Never mind that it hasn’t. As a backstrap weaver with mentors all over the world, it gets under my skin. I've sat through graduate-level lectures where professors told me the history of spinning and weaving, always in the service of some other, grander purpose (such as museum studies or archaeology), usually riddled with errors, and never, ever conscious of the scope of traditional weaving going on in the world today. I have tried to address this omission in my master’s thesis, Encountering Woven Knowledge, and in essays such as Does the Ethnographic Textile Exist? Perhaps the most maddening aspect is that pre-industrial textile methods can brilliantly illustrate most arguments that progressive academics might wish to make, if only they would look deeply and give it a chance. Communities of practice, body and mind integration, craft informing all realms of a culture, the intelligence embodied in making - these are important topics that need to be highlighted and written about, and which are amply illustrated by the ongoing, inimitable work of backstrap weaving in the world today. I’m reading through to the end of the book, because I do believe in the overall agenda of promoting ‘material intelligence,’ living in touch with things, and generally paying attention. I refer you back to my favorite words on craft ever. Hoffman, M. 1964. The Warp-Weighted Loom: Studies in the History and Technology of an Ancient Implement. Oslo (Reprinted, 1974, in the United States by Robin and Russ Handweavers). [iv] Vollmer JE. 1977 Archaeological and Ethnological Considerations of the Foot-Braced Body-Tension Loom. In: Gervers V (ed) Studies in Textile History. Toronto: Royal Ontario Museum, 343-354. [vi] Grömer, K. 2016 The Art of Prehistoric Textile Making: the development of craft traditions and clothing in Central Europe, Vienna: Natural History Museum Vienna. [vii] Franquemont EM. 2004 Jazz, an Andean Sense of Symmetry. In: Washburn DK (ed) Embedded Symmetries, Natural and Cultural. Albuquerque, NM: University of New Mexico Press, 81-94.